This classic wrap-around-porch farmhouse is updated with a master bath bay, breakfast bay, and sunroom with hot tub. This three-bedroom home is a great entertainer too, with fireplace, cathedral ceiling, and arched clerestory window in the generous great room. 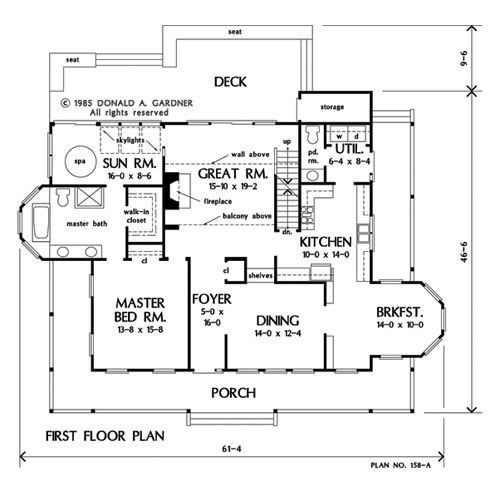 Both the great room and master bath access the glass-roofed sunroom. 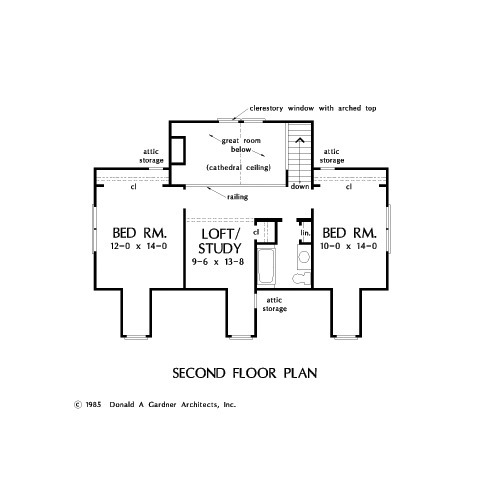 A garden tub, separate shower, and double lavs pamper in the privately located, first level master suite, and the study/loft can convert to a fourth bedroom. 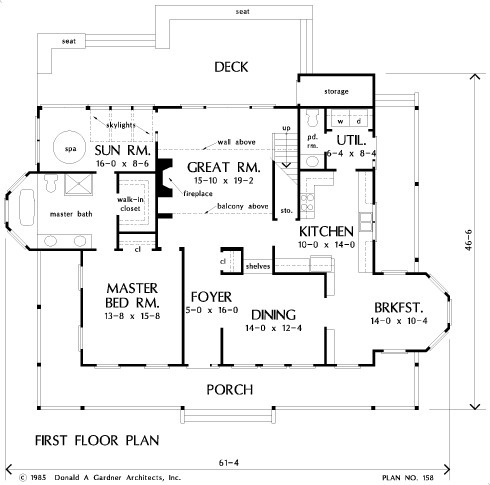 House Dimensions: 61' 4" x 46' 6"
Great Room: 15' 10" x 19' 2"
Foyer : 5' 0" x 16' 0" x 9' 0"
Great Room (Vaulted): 15' 10" x 19' 2" x 21' 6"
Kitchen : 10' 0" x 14' 0" x 9' 0"
Breakfast Room : 14' 0" x 10' 4" x 9' 0"
Utility Room : 6' 4" x 8' 4" x 9' 0"
Master Bedroom : 13' 8" x 15' 8" x 9' 0"
Bedroom #3 : 10' 0" x 14' 0" x 8' 0"
Porch - Front : 52' 8" x 6' 0" x 0' 0"
Deck / Patio : 36' 0" x 10' 0" x 0' 0"
Loft / Study : 9' 6" x 13' 8" x 8' 0"
Balcony : 13' 10" x 4' 4" x 8' 0"
Storage (Other) : 10' 0" x 4' 2" x 0' 0"
Storage (1st Fl.) (Sloped): 3' 2" x 8' 6" x 0' 0"
Other : 16' 0" x 8' 6" x 9' 0"